Ooh bon bons and books! I'd love to have me some $100 cash right now! After all my mama would benefit most! Here is a new book to add to your reading list and you can also enter the Just Ask The Universe Book + $100 Paypal Cash #Giveaway Event! It is warm here in LA. Can you believe it? I love this warmth and of course I can still find time to cuddle up with a book. BUT next week promises to be chilling...I mean chilly! haha. Maybe sometimes I'll be a writer eh. Now come have a good fun time with entering and sharing this event! Have you heard at least something about the laws of attraction. 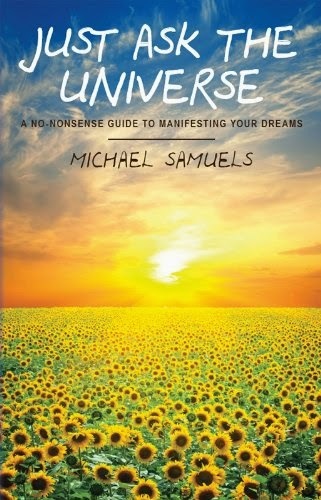 How about, Just Ask The Universe by author Michael Samuels? Just Ask the Universe is not a book of New Age gobbledygook filled with empty promises. Just Ask the Universe is a realistic guide to personal development. By creating a blueprint for self-growth and commanding your subconscious mind, the Universe will manifest all your dreams. For over two decades, Michael Samuels has studied and methodically tested hundreds of books on self-improvement, spirituality, and the metaphysical. Just Ask the Universe accumulates the wisdom from “thought teachers” like: Wallace Wattles, Anthony Robbins, Rhonda Byrne, Joseph Murphy, Robert Collier, and Napoleon Hill, and compiles it under one unified lesson: if your thoughts are clear and in harmony with your mind and the truth of your surroundings, your life can be filled with all the richness the Universe has to offer. This giveaway has been arranged by Away We Go Media on behalf of Michael Samuels who is responsible for this giveaway. JamericanSpice was asked to promote this giveaway and was not compensated for this post. This giveaway is open to 18+ years of age and US only. 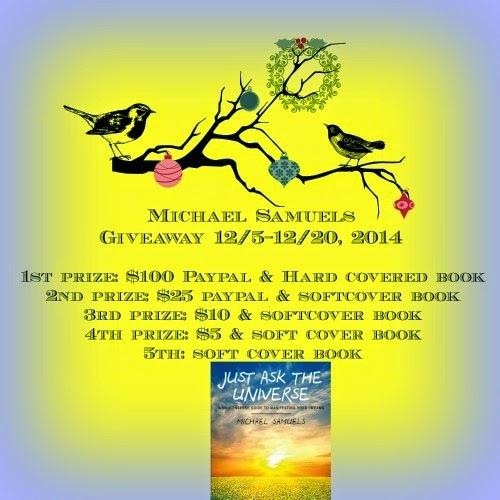 The giveaway will run from December 5, 2014 at 12 Midnight MST through December 20, 2014 at Midnight MST. There will be five (5) winners and will be chosen at random by Rafflecopter.com. NOTE: The first entry on the Rafflecopter is mandatory. You must enter your full name, address, and email in order to be eligible for this giveaway. However, this sole entry does not constitute a win for you as you must enter at least one other entry. If you do not follow this rule you will be automatically disqualified. All entries will be verified. Your address will not be sold to any third party and only viewed and used by Away We Go Media for the purposed of the winners chosen. To reintroduce this book, Michael Samuels is having a giveaway. This time he is giving away five prizes to five winners! If you would like your chance at one of these five prizes enter the Rafflecopter below. Make sure that you read the rules. I would ask the Universe for a home business, I have wanted this for so long. I would love to win this book and be inspired. I would ask the Universe to live on the California coast. i would ask the universe to live on a tropical island! Right now I need to ask the universe for a job since I will be laid off in two months. I'd ask the universe for a year off to travel the world and enough money to afford to do so!